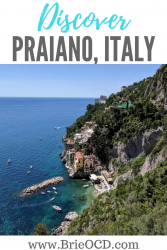 Most people have never heard of Praiano. So when my friend said they were getting married there, I’m like where? 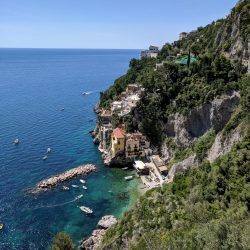 Praiano, Italy is on the Amalfi Coast and has stunning views. 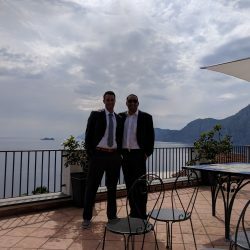 It is in such a great location visually that you can see Positano and Capri from just about any patio! 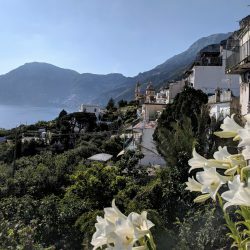 We were in Positano before Praiano so we took an easy 12 minute bus ride from Piazza dei Mulini in Positano (click here to read that review) to Praiano. So needless to say you don’t go to Praiano to do much besides relax. Seeing this was our last stop on our Germany/Italy tour and we were primarily there for a wedding, this was welcome news. As I mentioned above we stayed at Hotel Il Pino. 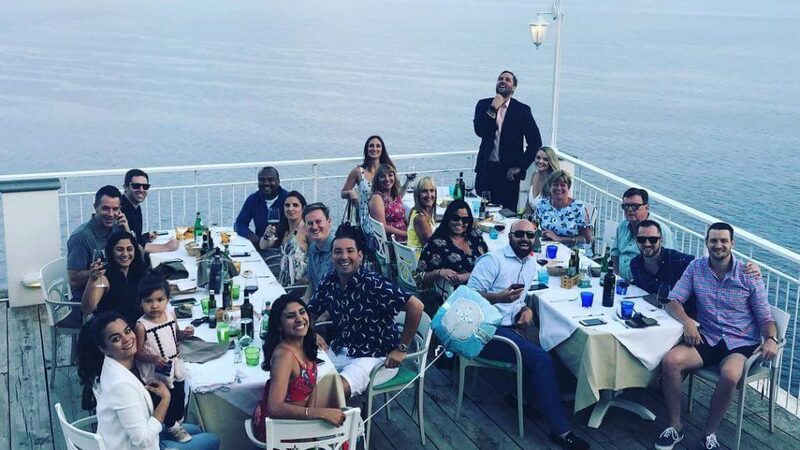 It had a nice patio and view and it was a great location in terms of being close to our friends that were getting married but the rest was just meh. Another couple stayed at Hotel Margherita (already sold out by the time we booked) and got a lot more bang for their buck. They had a hotel shuttle that would basically take them anywhere. A pool and lounge area, a private beach etc etc. 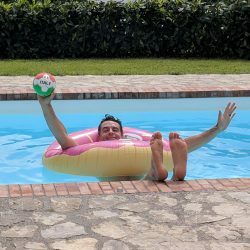 Hotel Il Pino is in the midst of building a pool (we were there during the groundbreaking, lucky us!) but I would say Hotel Margherita all day! VILLA GUILIA PRAIANO – PERFECT FOR WEDDINGS! Alternatively, you could book an AirBNB or VRBO. Our primary reason for this entire trip was for Dub and Laura’s wedding! 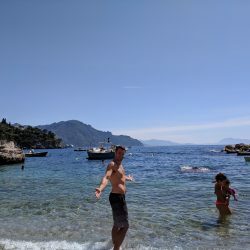 They rented a villa through VRBO and it did not disappoint! 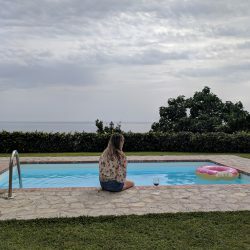 Villa Guilia Praiano was clean, ginormous, had a pool, hot tub and AMAZING views. 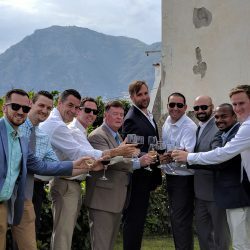 Melanie from Summer In Italy property management company was instrumental in this gorgeous wedding. 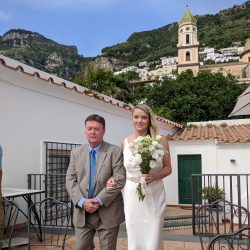 She was fast, responsive and literally coordinated everything with the owner and caterers making Laura feel at ease and excited for the day to come. I was surprised to find out that the owner of this gorgeous villa was also the caterer. I have to say that this was hands down the best meal we had in Italy. About 6 guys showed up around 11am the day of the wedding and literally cooked their buns off until 8pm. There were multiple homemade courses that ran the gamut from burrata to a spicy yogurt fruit bowl (so unique and delicious) to lobster spaghetti (homemade spaghetti!) to pistachio crusted tuna balls. OMGEEE it was amazing. Every course was carefully thought out and executed with tender loving care. The meal in itself was an experience and something I will never forget! 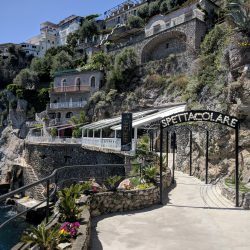 If you are ever planning to get married on the Amalfi Coast, this place was perfect in every way. 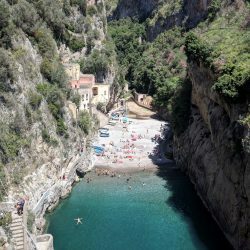 While there isn’t much to do in Praiano it is perfect for quality time with your family and friends and it’s only a hop skip and a jump away from the more populated, busy cities. 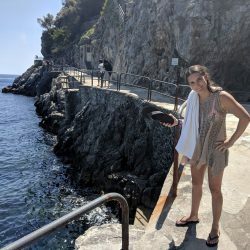 A lot of people took day trips to Amalfi, Positano and Capri. Easy Peasy! #1 bring water shoes. These Italians didn’t get the memo about sand at the beaches. They are all filled with rocks. I could barely get in the water because the rocks were killing my feet. I ended up sitting in the shallow water and then doing this crawl move to get in. #2 Bring Dramamine – the hillside is topsy turvy and if you have a tendency to get car sick you WILL here. 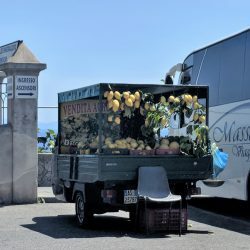 #3 Land of the Lemon – if you love lemons then Positano is the place to be! Lemon everything! #4 There is a Coperto (cover charge) to eat/drink everywhere. It is usually 1.50 Euro per person to sit and dine. Praiano seems to be a bit more lax about this charge than other parts of the Amalfi. #5 Water is not free when dining! And while Wine is not free either, its cheaper! So save water and drink wine! We walked for the most part in Praiano because the bus wasn’t that reliable here. (understatement). They have the internal Praiano bus and the SITA bus that will take you to places outside of Praiano. 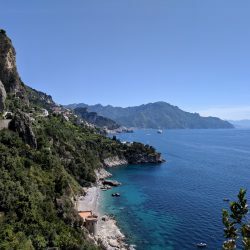 We caught the bus to Conca Dei Marini but then couldn’t catch it back (spoiler alert: we ended up walking 6 miles in flip flops!! However the memories from that walk will last a lifetime). There are cabs in Praiano but they will cost you a fortune. My advice is lace up them sneaks and get walking! You can also take a private boat from One Fire Beach to the other islands in the neighborhood. We were there for the wedding so we partied mainly at Dub & Laura’s villa. However, there is a nightclub called Africana that is in a cave. It looks really cool but this old lady couldn’t stay up that late to find out! Che Bonta – Pizza and beer! Need I say more?! This is a must if you are staying in Praiano. The pizza is delicious and they are reasonably priced (about 10 euro per pie). They deliver too! We ate here almost every day because it was an easy, cheap and delicious option. Bar del Sole – Is the place to be! Really it’s one of the few places in Praiano LOL. It is open day and night and has arcade games, a cafe, a convenient store and gelato! The workers are super nice and helpful. 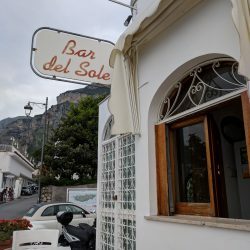 I highly recommend Bar Del Sole! 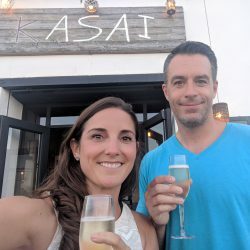 Kasai– This restaurant was awesome! If you are in Praiano, this is a must. The service was impeccable, the views were amazing and the food was delicious! We were waiting for our friends to show up and they handed my husband and I a glass of prosecco and said, “it’s better to wait with a drink”. I Agree!! They also brought us limoncello shots at the end of our dinner! 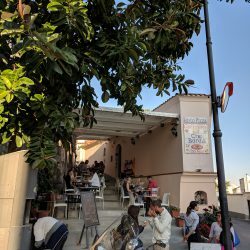 Overall, Kasai was a breath of fresh air compared to other restaurants on the Amalfi Coast. I would definitely go back! Il Pirata – Ok so I wanted to try this restaurant because it got great reviews on Tripadvisor. I have to say it was just ok. We got the prosciutto and melon appetizer and there wasn’t enough melon to accompany the prosciutto. They forgot to put in our entree order and when I finally said something you could see the confusion on the waiter’s face. 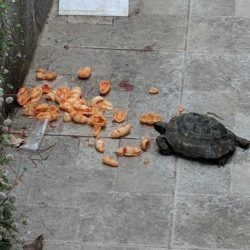 The food was just ok. 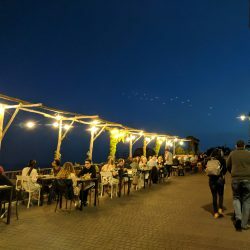 It is right near Marina dei Praia and Africana. 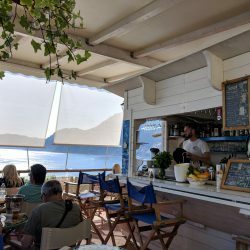 The location and views are awesome but everything else was just ok.
Mirante Bar – Go see Chiros on the way back up from One Fire Beach and grab a cold beverage. They only serve light snacks and drinks but Chiros is so creative with his cocktails. the view is amazing and the vibe is chill. This is a must do! 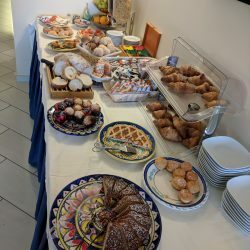 Caterers – If you are planning an event in Praiano you need to book the caterers from Villa Giulia Praiano. See above to hear all about the food and experience. 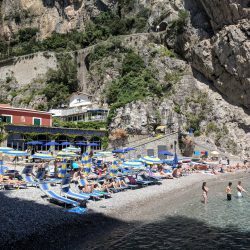 Conca Dei Marini – Take the bus down to Conca Dei Marini, grab a beach chair, a Peroni and relax! 7 euro per chair, another 6 for an umbrella. We passed on the umbrella because the beach chairs had a face shade that was pretty awesome. Warning the beach and water here is ROCKY. This is the perfect time to have your water shoes so you can get in and out of the water with ease. 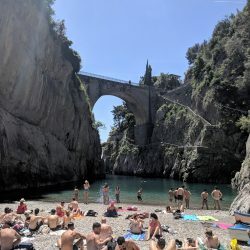 Furore Beach – What a cool little spot! Bring a blanket and a beach chair and just chill! The beach is tucked away under a bridge and the view it makes is amazing. Marina dei Praia – Take the internal bus or walk to this marina filled with restaurants, boats and lounge chairs. 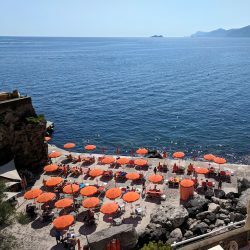 You can rent a beach chair for 8 euro (umbrellas are additional 5 euro), relax for a bit, get a bite to eat and just chill out! This is right next to Il Pirata and around the corner from Africana. 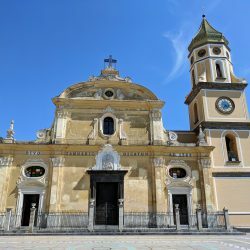 San Gennaro Church – We didn’t go inside but the outside of this church is beautiful. 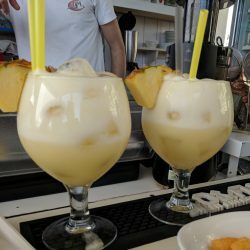 It is right across from Bar Del Sole, you can’t miss it! Cooking Class – We didn’t get a chance to take a cooking class but I highly recommend you do so! You can take a class for about 70 euro per person at Il Pino or Sergios Home Cooking Class. Day Trip – Take a private boat from One Fire Beach to Positano (or take the bus) or Capri or Amalfi for the day! 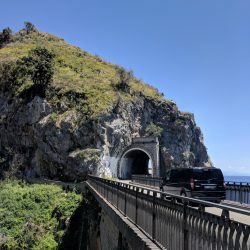 Sentiero Degli Dei Hike – Hike of the Gods – we actually did this from Positano but you can also do it from Praiano. Views are AMAZING. 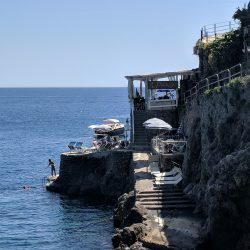 Check out my review on it from my Positano blog by clicking here.